ROTTERDAM, Netherlands, Jan. 23, 2019 /PRNewswire/ -- In 2016 the International Hockey Federation announced a partnership with SportGroup's leading brand, Polytan, as World Cup and Olympic Partner and supplier of hockey fields for the 2018 and 2022 hockey World Cups as well as the 2020 Olympic games in Tokyo. Tokyo has set itself the goal of organizing the first-ever carbon-neutral Olympic Games in 2020 by using green technologies. 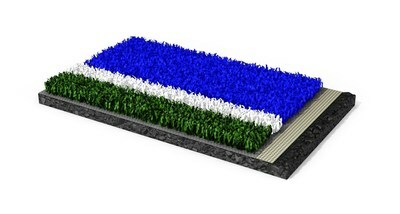 Polytan, a leading supplier of world-class hockey fields and Global Partner of the FIH, is making an important contribution by developing the sustainable hockey turf Poligras Tokyo GT (Green Technology): 60% of the filaments are based on Braskem's renewable I'm green™ polyethylene technology. Polytan is using bio-based polyethylene to add a sustainable dimension to the outstanding playing properties of its tried-and-tested polyethylene monofilament fibres. "FIH is delighted that this new turf technology will support Tokyo's carbon-neutral vision and make a positive contribution to the Games. FIH has a strategic priority to improve hockey's environmental footprint, which is why partnerships with progressive companies such as Polytan are crucial. We are pleased to note that the surface that will be used in Tokyo requires 2/3 less water than surfaces used at previous Olympic Games. FIH firmly believes that hockey can contribute to a more sustainable environment by making use of all the technological possibilities modern turf offers," FIH CEO Thierry Weil stated. "We are so proud that Polytan and the FIH have chosen Braskem's I'm green™ polyethylene for the hockey fields for the games in Tokyo in 2020. Tokyo has set itself the goal of organizing the first carbon-neutral games, and we are happy that Braskem can make its contribution together with the FIH and Polytan," added Marco Jansen, Commercial Director, Renewable Chemicals Europe & North America at Braskem. I'm green™ polyethylene is a plastic obtained from ethanol derived from sugar cane. It is a vegetable raw material that, during its growth, captures carbon dioxide from the environment. The reason why Polytan has chosen this raw material for its artificial turf production is that the carbon footprint of I'm green™ polyethylene has a positive impact compared to fossil polyethylene. For every kg of I'm green™ polyethylene used in Polytan's hockey fields for the games in Tokyo in 2020, almost 5 kg of CO2 will be saved. All this is being achieved without any compromise on the quality of the turf. The best perform on Polytan – that has been the ideal pursued by Polytan since 1969. With a constant eye on the latest findings in the field of sports medicine, the specialist in outdoor sports surfaces is continuously refining its synthetic surfaces and synthetic turf systems. High-quality synthetic surfaces now range from shock-absorbing soft-impact surfaces and multi-functional all-weather pitches all the way to high-speed surfaces for international athletics events. As well as developing, manufacturing and fitting its own sports surfaces, the spectrum of services provided by Polytan also includes line markings, repairs, cleaning and maintenance. With a human-oriented global vision of the future, Braskem strives every day to improve people's lives by creating sustainable solutions with chemicals and plastics. Braskem is the largest producer of thermoplastic resins in the Americas and the leading producer of biopolymers in the world, creating more environmental-friendly, intelligent and sustainable solutions through chemicals and plastics. Braskem exports to clients in approximately 100 countries and operates 41 industrial units, which are located in Brazil, United States, Germany and Mexico, the latter in partnership with the Mexican company Idesa. For more information, visit www.braskem.com.